China train ticket price hardly changes once it is settled. However, from April 28 to the end of 2018, China Railway Corporation has adjusted the ticket price of 28 intercity high speed routes, some of which may enjoy a discount as great as 20% off the original price. It will further optimize the train ticket price of six high speed routes according to factors such as number of trains, seat occupancy rate, travel season, period, and seat class as from July 5 this year. At the same time, China Railway Corporation stressed that, in the future, they would adjust high speed train ticket price on a daily basis. 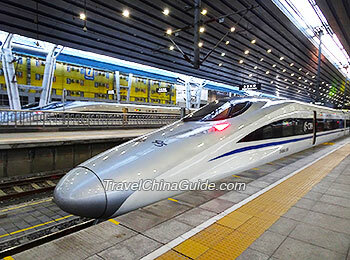 It means China high speed train ticket price will fluctuate by day, just like flight tickets. Market supply and demand are the main drives for train ticket price change. Obviously, popular high speed routes such as the Beijing - Shanghai and Guiyang - Guangzhou high speed railways are more likely to see a rise in ticket price. High speed trains with lower seat occupancy rate may expect a price drop. Different departure dates and times may also influence the price. From the perspective of passengers, they can choose trains more flexibly and decide when to travel according to ticket prices. Those who are flexible in time can avoid travelling in the peak seasons, peak dates and peak time, while those who are restrained by time may need to spend more on train tickets. 1. Avoid travelling during Spring Festival Travel Rush period, usually lasting from late January to early March. Train tickets are in high demand during these periods, which in turn may cause a rise in price. In other public holidays including the Qingming Festival, May Day Holiday, Dragon Boat Festival, Mid-Autumn Festival and National Day Holiday, high speed train tickets also tend to be more expensive and hard to obtain. 2. China's summer holiday in July and August witnesses a large number of student passengers, incurring the increase of high speed train ticket demand. Thus ticket prices may rise a little bit. 3. It's advised to travel on working days from Monday to Thursday. Friday, Saturday and Sunday are peak travel days. 4. Normally, fewer passengers travel in early morning and late evening, so the tickets during these periods are cheaper. For short distance travel, high speed train ticket price has an absolute advantage, while for long distance travel, flight ticket price used to be more appealing because it may have greater discount. Now that high speed trains also offer discounts, they can better compete with flights.